A security checkpoint at Dallas/Fort Worth International Airport was shut down for about an hour after screeners found a live round of ammunition in a carry-on bag Monday afternoon. Security screeners found a 40 mm round in the luggage of a military passenger at a checkpoint in Terminal D near Gate 30. The ammunition is the kind the military uses in grenade launchers. Police said the incident was an accident, saying the soldier thought he had cleaned everything out of his bag. A security checkpoint at DFW Airport's Terminal D was shut down for nearly an hour after screeners found ammunition in the carry-on bag of a military passenger. Investigators said the man forgot about the ammunition. 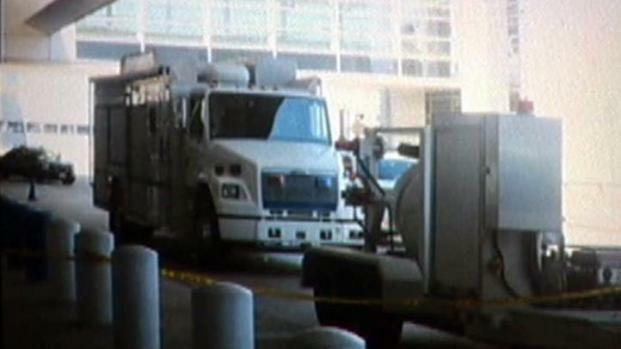 DFW Airport spokesman David Magana said the airport set up a 300-foot perimeter around the bag. The checkpoint was down for about an hour, and no flights were affected. Airport screeners found 1,306 guns in carry-on bags last year. Airport officials say TSA agents are spotting contraband and stopping it before it makes its way onto flights. "[It's] very refreshing, especially when you are waiting to go home," said traveler Judy Major. "I can't say enough how that handled it -- it was perfect."